QUITO, Ecuador (CNS) — Saying that having received the keys to the city made him “at home” here, Pope Francis called for inclusiveness, dialogue and mutual respect in civic life in Ecuador and the rest of Latin America. 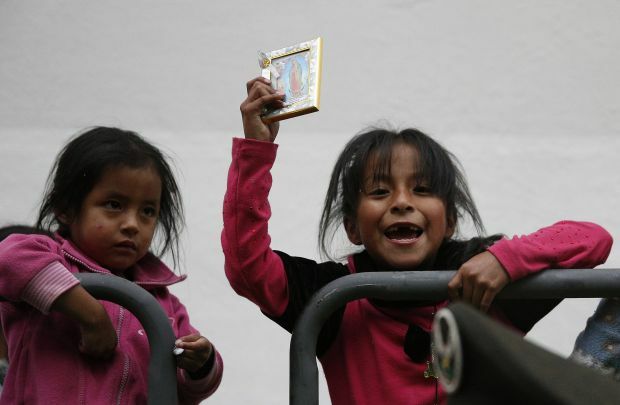 In a democracy, all social groups — indigenous people, those of African descent, women, civic groups and those in public services — must have a voice, the pope told representatives of civic organizations gathered at the Church of St. Francis in Quito July 7. Pope Francis’ call for dialogue came at a time when leaders of Ecuadorean nonprofit groups, especially human rights and environmental organizations, complain that they are harassed when they criticize the government. Just as children learn to share what they have received freely from their families, justice requires the sharing of goods and natural resources to ensure that all have a decent life, the pope said. Mentioning Ecuador specifically, the pope said that natural resources should not be tapped for immediate gain, but must be managed so future generations can also enjoy them. Conflicts in this country in recent years, especially in the Amazon region and along the southern border with Peru, have centered on plans to drill for oil under Yasuni National Park, which is also home to two nomadic indigenous groups that largely shun outside contact, and to allow open-pit mining for minerals such as copper and gold. Critics fear the projects will harm indigenous communities and contradict the Ecuadorean Constitution’s protection of the rights of nature, which President Rafael Correa highlighted in his welcoming remarks to the pope July 5. Similar conflicts have erupted in other countries, including Peru and Bolivia, where governments depend on natural resources such as minerals and timber to boost economic growth. Problems common to many of the region’s countries — including migration, urban growth, consumerism, the crisis of the family, unemployment and persistent pockets of poverty — must be addressed jointly by governments and the wider society, Pope Francis said. Both legislation and civic actions must “promote inclusion, open avenues for dialogue, and leave behind the painful memory of any type of repression, disproportionate control and the erosion of freedoms,” he said to applause from the audience, which included business and indigenous leaders and members of various civic groups. Opponents of the Correa administration charge that the government has taken advantage of its majority in the legislature to impose new measures, including a communications law that restricts freedom of expression. Echoing one of his messages from the previous day’s homily, Pope Francis urged subsidiarity, or respect for diversity, saying that each person makes a particular contribution to the common good. Society as a whole must mirror the family, where members share their joys and sorrows and love each other as they are, despite their faults, Pope Francis said.